It's hard to "cut through" all the marketing noise today. Adopting state of the art technology is just one piece of the puzzle. Creating great content is an essential component of Marketing Automation success. Eloqua is leading the way in generating revenue opportunities through great content and great technology. To demonstrate the point the company is growing at a blistering pace while simultaneously acquiring industry recognition for great marketing campaigns. Join our webcast as Stuart Wheldon, Senior Director of Customer Success and Strategy at Eloqua, makes "The Case for Content" . 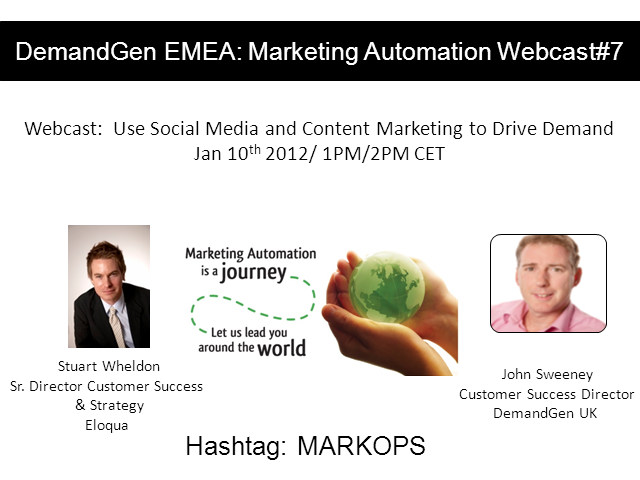 Together with Demand Gen's John Sweeney, this webcast will explore how great content and marketing automation combine to generate revenue. Stuart Wheldon is Senior Director of Customer Success& Strategy, EMEA and Asia Pacific at Eloqua.Based in London, he is responsible for managing Eloqua's regional Customer Success Teams and growing Eloqua's customer relationships in these regions.